Turmeric beauty masks have been used across Asia for centuries. They are known in Chinese and Indian traditions, and are an element of the Ayurvedic medical system. In south Asia, they were an integral part of the bride’s wedding preparations, making her look spotless and glamorous on her big day. Turmeric contains a photochemical called curcumin, which can benefit the body, both inside and out. 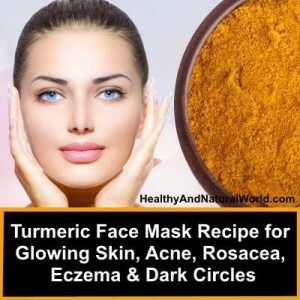 Turmeric mask works for acne and eczema. It reduces inflammation and redness, and promotes skin healing. Due to turmeric’s antioxidant properties, it has been used for skin rejuvenation. It helps softening lines and wrinkles, giving the face a more youthful appearance. It is also effective with rosacea – a chronic skin condition that is characterized by redness and pimples. It eases the redness and treats this disease. The turmeric basic face mask is easy to make and acts as a moisturizer, exfoliator and reduces redness. It brightens the skin and makes it look fresh and clean. There are many variations for the recipe, but below you will find the basic recipe. Some add chickpea flower to thicken the paste. Let the mask dry on your face. This means living it on for about 20 minutes and then washing it off with cool water. Dry your face gently with a cloth. If you use turmeric internally you need to be aware that turmeric has low absorption and you need to consume it in a way that will improve its absorption. I wrote in the past about the best ways to consume turmeric as well the best turmeric recipes to improve it bio-availability. Here is a video with detailed instructions on how to make and apply the turmeric mask. The woman in the video is using a slightly modified version of the above recipe and adds organic brown rice flour.